Welcome to The Great Allegheny Passage. Where freight trains full of coal and steel once rumbled over the Continental Divide in western Pennsylvania, today bicyclists, dog walkers and children in strollers enjoy a well groomed trail. By connecting to the Chesapeake & Ohio National Historical Park in Cumberland, Maryland, a traveler can start their journey in downtown Pittsburgh and end up in Washington DC, a distance of almost 235 miles. This is one of the up and coming trail destinations in the country lauded in the New York Times, the Washington Post and most recently by National Geographic as one of the best Fall Trips in 2012. The conversion of abandoned rail lines into trails is a success story that has been repeated across the country. The Rails to Trails Conservancy has documented over 1,600 of such preserved pathways. Thanks to the leadership of Linda Box, President of the Allegheny Trail Alliance, The Great Allegheny Passage was created and re-branded from a collection of seven trail organizations and connected with the C & O Canal Towpath trail. The 3,300 foot Great Savage rail road tunnel was rebuild at a cost of $12 million dollars as one of the central attractions. Standards were set for maintenance from the great rail trestles to grooming the trail surface. This conversion of an old rail line to a long distance trail is a good story, but not a new story. What is newsworthy about the Great Allegheny Passage is the work that has been done to revitalize the region. The trail is a linear laboratory on how to work on a landscape scale. – Development of a Trail Towns program modeled on the Main Street approach. Booklets, training programs and CDs were shared with trailside communities. The program is now linked closely with business development in trail communities. 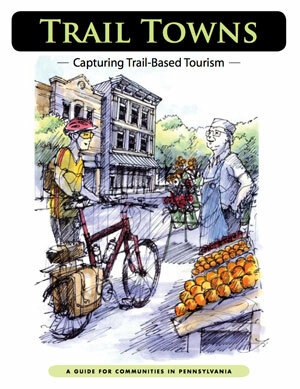 The strategies have been widely adopted by other trails and heritage areas. – A partnership with the Student Conservation Association (SCA) to place student conservation corps members in the trail communities. The students are available to do market research, grant writing and assist with trail-related special events in the communities The SCA mission is to place high school and college age students in conservation service positions primarily in public lands working on ecosystem or environmental protection projects. These Trail Town corps members are getting a real world experience in the protected areas of the future, living places where conservation and daily life must coexist and serve each other. – Financing for local entrepreneurship is a real barrier for those who want to invest in the new recreational trail economy. The Allegheny Trail Alliance has worked close with The Progress Fund, a Community Development Financial Institution, which helps small businesses get started serving the tourism economy. The fund provides counseling along with the money to make a small business successful. Bed and Breakfasts, outfitters and bicycle shops have sprung up along the passage with help from the Progress Fund. All of this work and so much more has had an impact on what was an economically depressed region. Economic studies in the region have shown measurable economic benefits. These strategies deserve to be integrated into the work of all large landscape practioners who want to partner with communities for sustainable growth. PS – If you want an up close and personal experience, I suggest going for a ride on The Allegheny Passage. The Rails to Tails Conservancy Northeast Office is featuring a fully supported ride on the trail starting June 23, 2013 as part of their annual Greenway Sojourn.